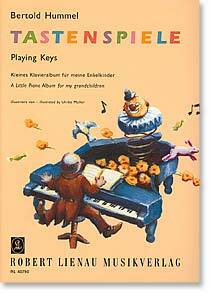 The "Tastenspiele" are a collection of 16 easy to medium-difficult piano pieces written by the composer for his grandchildren. One is tempted to speak of modern "Kinderszenen"; the pieces are appealing, varied, musically sophisticated and suitable for introducing children but also adults to contemporary sounds. The wonderful illustrations by Ulrike Müller make the book a pleasure for the eye as well. Belonging to the school of Hindemith and Genzmer, he was already open in the 1950s to a "plurality of compositional methods". Familiar with Gregorian chant from his childhood on, he increasingly developed interest in modal procedures, going as far as dodecaphony - but he was at the same time fascinated by tonal extensions such as polytonality or Messiaen's sound colour theories and the rhythmical accomplishments of other cultures. The composer of this book is then genuinely eclectic, has written music "suitable for children" in a child-like spirit, but has produced a real firework of colours and styles. A super book, an absolute "must" for all who have children to give presents to or are still child-like themselves. My pupils were particularly attracted by the dedications. Like detectives, they put together theories and guesses about why the "The Clown" should be especially "for Fabian", whether this whirling and insistent "Scherzando" perhaps corresponds to the Josephine's character, or whether Rafael ("Desert Caravan") maybe particularly likes playing on the black keys, because each of the pieces in the Tastenspiele by Bertold Hummel has in the dedication the name of one of his 16 grandchildren. With this piano album, Bertold Hummel makes young pianists into jugglers: left and right hand throw contrapuntal balls playfully back and fore or transport melodies with hand-crossing into new regions and octaves. Independence and co-ordination of the hands and fingers are stimulated by combinations of wide and close positions and movements, by varied requirements of articulation and dynamics. The author, who died a few months ago, dedicated these16 pieces expressly to his 16 grandchildren. As a result, not only are the levels of difficulty confined to upper first level and lower middle level, but also special consideration is given to the temperament and interpretative capacities of each recipient. This is the unique attraction of this collection. The most varied forms and styles are included, from folk-song to jazz rhythms and sounds, from simple homophony to free-tonal counterpoint, from uniform movement in eighth notes to the most quirky off-beat rhythms. Each piece is based on its own clearly formed musical or technical idea. In almost all pieces, however, a certain fundamental aim can be detected: to make a real experience out of the many aspects of piano sound, in the contrast of high and low, forte and piano, legato and staccato, the use of the pedal. This is underlined by the precise naming of the pieces (occasionally one might disagree, e.g. No. 3), challenging in various ways the awareness of the pupil. The book opens the way to numerous musical and technical experiences and provides, with its characteristic titles and the entertaining illustrations by Ulrike Müller, constantly new pleasure. Finger exercises, a hectic party, clowning, and no timidity with "wrong notes": 16 easy character pieces to perform, heart-warming souvenirs for a concert of the very young, now published in Memoriam. With the Children's Pieces by Bertold Hummel, refined and entertaining display pieces came into the programme.